Amazon just announced the new Fire TV Stick 4K, which is available for pre-order right now. It’s priced in between the Fire TV Stick and Fire TV, and it’ll undoubtedly be a top-seller. If you want a new media streaming device and you have no plans to pay extra for content in 4K though, we’ve got another option you should consider. 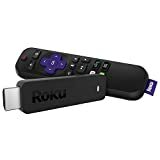 Amazon is running a sale right now on Roku Streaming Stick refurbs that drops the price to just $39.99. That’s a killer deal and we expect Amazon’s inventory to sell out pretty quickly.